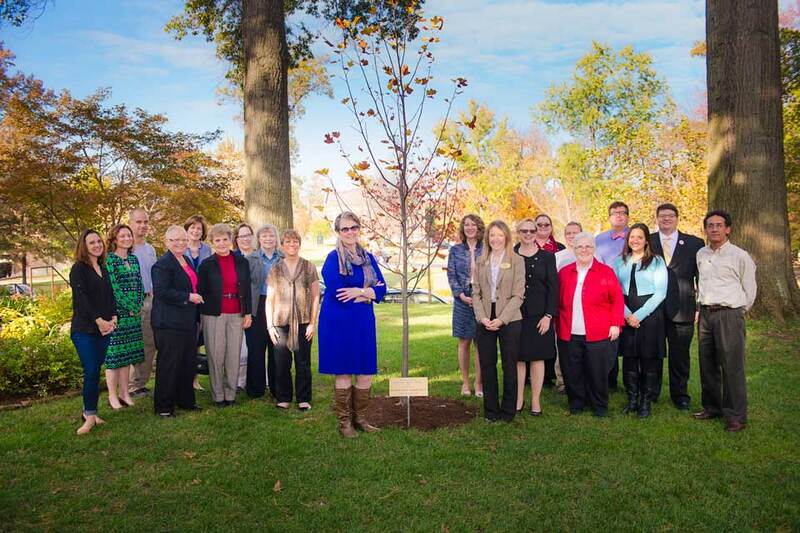 Webster University President Elizabeth (Beth) J. Stroble, chief communications officer Barbara O’Malley and members of the Centennial Planning Committee recently honored chairperson Elizabeth Thurmond Robb, BA ’65, with a tree has been planted in her honor in Centennial Plaza in front of Webster Hall. Robb has led the plans for the centennial for three years, presided over more than 20 meetings and has been the driving force to its success. The Liriondendron Tulipifera (Tulip Tree”) has been named the “Next Century Tree” in Robb’s honor. 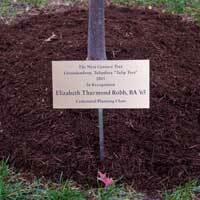 The tulip tree planted in front of Webster Hall has been named the “Next Century Tree,” in honor of Centennial Planning Committee chair Elizabeth Robb. Through the year-long celebrations, Robb, her co-chair Barbara O’Malley and the rest of the Webster University Centennial Committee have established an impressive list of assets that will serve to strengthen Webster University’s culture and opportunities for students for many years to come as well. “I have been so honored to be a part of this wonderful university and this wonderful group. I couldn't have done without you all — especially my co- chair Barbara O’Malley who is amazing,” Robb said. The Centennial Plaza located in front of Webster Hall, home to the Centennial flag and the time capsule buried in 2015, will serve as a resting place for those who come after us. It will inspire them to reflect upon the past, celebrate the moment and project into the future. The Homecoming Garden Glow event will serve our alumni for many years to come – inspiring them to return home to their alma mater for rejuvenation of global citizenship spirit. The biennial Global Student Leadership Summit will continue to inspire global students to assemble in a common place and learn from each other, about themselves and about their University. An annual retiree event will inspire those who commit their lives in service to Webster to return and celebrate the accomplishments of this great institution. A new alma mater, “Webster U, You are Our Home,” written by a current student in 2015 and performed at every future Commencement ceremony, will instill a sense of pride in our students, faculty, staff and alumni. The new University mace for commencement will remind us all of our pursuit of global academic excellence. A fight song, “Go, Go, Gorloks!,” written by a Webster alumnus, will be presented at athletic events as a new tradition. The Centennial coffee table book, Webster University: A Century of Defining Moments, will sell every holiday season as a reminder of Webster’s storied past and bright future. Nine Network’s documentary, Webster University:100 Years, will continue to inspire those who watch it to commit and recommit to Webster University’s mission and vision. The Centennial Scholarship match program raised over $2 million. Governmental recognition at local, state and national legislative levels – from local mayors to President Barack Obama. Centennial Homecoming received record-breaking attendance. 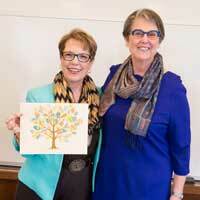 Global engagement of faculty, staff, students, alumni and community members strengthened the network. Media coverage included more than 233 stories mentioning Webster’s Centennial around the world, reaching a potential audience of 213 million and providing a $2 million publicity value. Groundbreaking of the Interdisciplinary Science Building laid the groundwork for the future of STEAMM at Webster. Over $1 million was raised in support of the Centennial Gala and the Next Century Leaders Scholarship Program.